In my ongoing drive to help people make more of their own clothing, I offer up a new workshop with my friend Lauren Taylor, known to many as LLADYBIRD. We want you to make more of your own clothing, and this weekend will help make that a reality. This workshop will be all about elemental, pragmatic sewing skills, and getting comfortable choosing which patterns to sew, and from which fabrics. The core focus of the workshop will be to make yourself a pair of jeans, but there will be much more to learn and more information shared. In this three and a half day workshop Lauren returns to AGOS to help a small group build the skills necessary to create the fundamental elements of a handmade wardrobe. Focusing on Jeans and Tee shirts, but touching on other items, Lauren will show you how to sew up those classic basic items that we all live in. This will be a weekend to get very comfortable with the skills to make clothes you will wear for the rest of your daily life. The modern world of home garment sewing has evolved beyond special occasion sewing with the release of patterns like the Ginger Jeans, the Archer shirt, the Hudson pants, and the plethora of Tee shirt patterns out there. Nothing is quite as gratifying as wearing a pair of jeans that you made, but no one recognizes, because they're so normal. Especially when they fit you just how you want them to. When it comes down to what you reach for day in and day out -those workhorse elements of our wardrobes- sewing the basics has become the focus of so many sewists. The increasing awareness of where those $30 jeans at the box stores come from, and the icky world of Fast Fashion, has made us all more eager to learn how to make the basics. Sewing your first pair of jeans is a game changer. Getting comfortable sewing with knits is empowering. In this unique retreat, Lauren and I will share our knowledge of how to take classic patterns and make them into garments you will wear again and again, with the skills to do so when you get back to your sewing space. 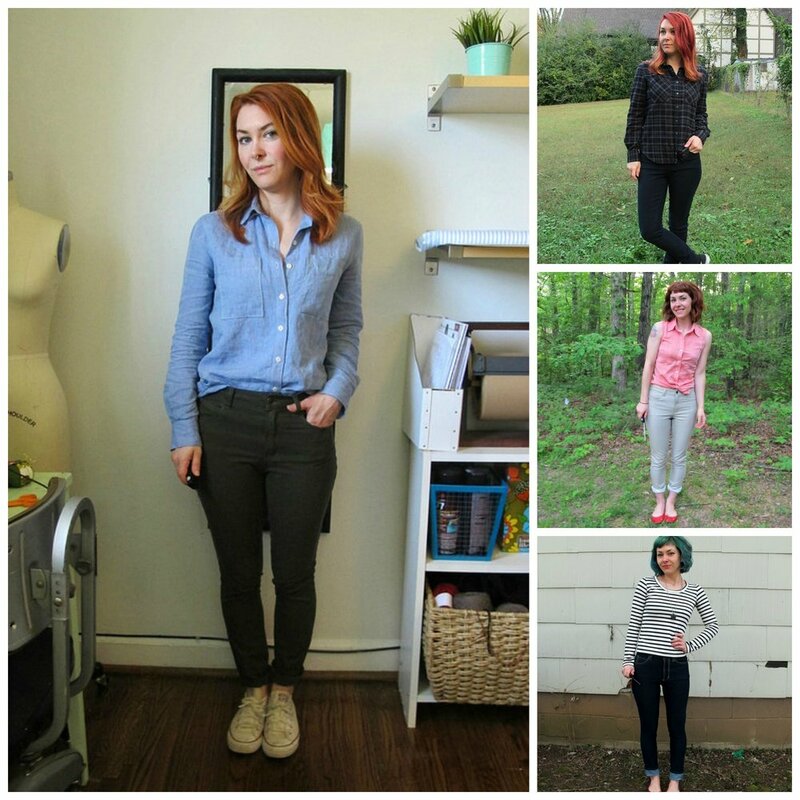 Lauren Taylor is a favorite of mine for her infectious enthusiasm for sewing your own clothing. This will be a slightly different version of the retreats that she and I have done in the past. This time we both will be on hand for instruction and consultation. Lauren is an incredibly generous teacher, and her ability to inspire others to sew for themselves is so exciting to be party to. Lauren will weave her personal magic to help you gain the skills to make a pair of jeans, a Tee shirt, or whichever basics you need in your closet. I will be on hand to help with information about fabrics to choose for projects, tips and tricks for successful making, and general support. We're going to do a lot of sewing, but mostly we're going to have a lot of fun! The first night of the retreat Lauren and I will present a 'trunk show' of a wide array of sample garments for you to touch and try on. The idea being to show you what types of fabrics go with what types of patterns. Lauren has made up a full set of Gingers jeans samples, in all the sizes from 0-20, for you to try on! This is an incredible opportunity for those eager to make jeans, but uncertain of where to start. If jeans aren't your thing, or if you have already made a pair, I will have a set of samples of different shirt/dress fabrics made up, also available to try on. Curious about the difference between rayon and voile? Let me help you with that. Throughout the weekend we will give short tutorials on various construction techniques such as: zip or button flys for jeans; invisible zipper insertion; sewing knits on a regular machine; bias facing insertion; interfacing types and applications; buttonholes; collars and collar stands; and more. To top it all off, I'm going to send you home with a set of fully identified fabric swatches to refer to when you go to sew up more garments for your wardrobe. Be sure to bring a notebook to take notes, there will be a ton of information presented at this workshop....! Lauren Taylor is a sewing enthusiast and rad sewing instructor based in Nashville, TN. 100% self-taught, Lauren has been sewing for most of her life and makes pretty much all of her clothing at this point. In addition to teaching fun sewing classes and workshops, Lauren also works professionally in wardrobe + alterations, as well as in sewing production for a local clothing designer. Lauren blogs for the Mood Sewing Network, and at her own blog, LLADYBIRD.com. If you haven't yet read any of her posts, go give them a read. I guarantee you you'll be inspired! This will be my first retreat at Rabelais, the book store I began with my husband, at the North Dam Mill in Biddeford. Since January of 2017, Rabelais and my studio for AGOS have shared digs in the North Dam Mill, a cool former textile mill that has been renovated into studios, offices, and light industrial space. While this space is not as dedicated to sewing as my studios in Portland were, nor as spacious, the spirit of textiles is deep in the bones of this building. 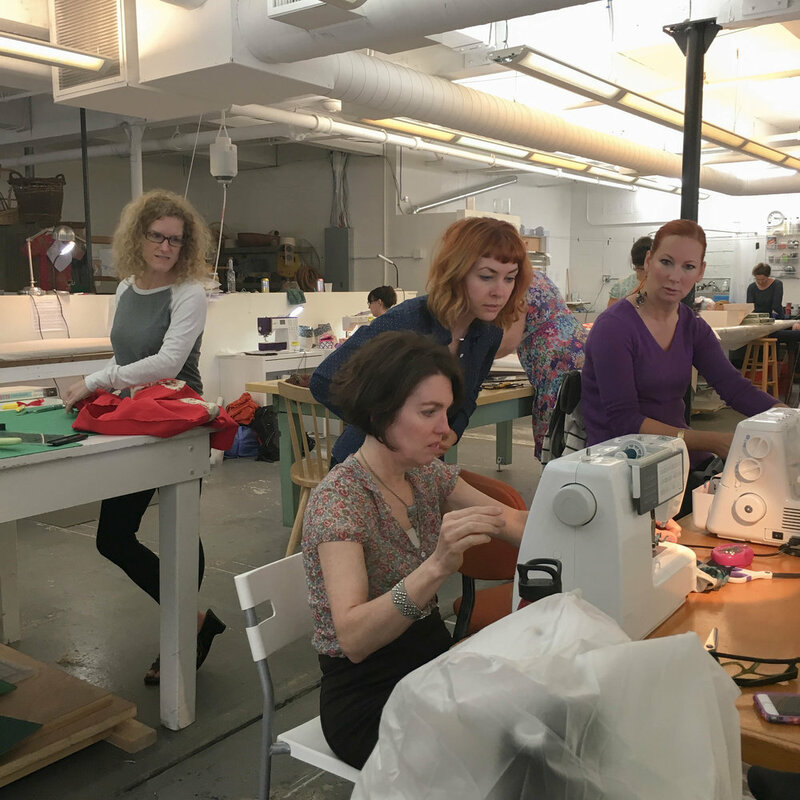 We will have cutting tables, ironing stations, and sewing tables set up for ten sewists. There will be plenty of space and opportunity for sewing growth! Every day we will have lunch together, provided by our good friends Four Star Fresh, here in the Mill, and on Saturday night we will head out to a special dinner. You will need to secure your own housing. Biddeford and the surrounding towns have a number of options, including AirBnB's and basic hotels, but nothing particularly plush. A little further away is Kennebunk with a large selection of housing options. Portland, which is a 20 minute drive away has even more options. For these two options, you will definitely need a car. If you are coming from afar, Portland is the closest airport, and serves most major airlines, as well as Amtrak and a couple of bus lines. If you need guidance with travel arrangements, give me a holler. In order to give you plenty of time to check, and double check, your schedule, and confer with partners, bosses, children, parents, and pets, to make sure this will work for you, I delay the opening of registration. You will be able to register for my retreats on Monday, March 5th at 3:00pm EST. The opening will be announced in the newsletter. So if you are not on the newsletter email list, sign up now! The link is at the bottom of the home page.